Castle Rock’s season finale is next week. But if you thought you had an idea of where the Stephen King-inspired mystery series was heading, this week’s episode, “Henry Deaver,” will make you rethink everything. Or, it’ll confirm all the sneaking suspicions you’ve had all along. Or maybe...both. Now, quite obviously, this phenomenon was going to have some bearing on the strange case of the Kid (Bill Skarsgård) — hidden deep within Shawshank prison for decades for reasons that are finally (albeit not fully) explained in “Henry Deaver.” But first, the episode drops us straight into one of those other “possible presents,” and we meet another version of Henry Deaver...and he looks just like the Kid. Skarsgård’s Henry—who’s adorably thrilled to hear that his wife might be pregnant—has just presented a breakthrough discovery (the test subject is a cat named Puck; attentive Castle Rock viewers will recognise that was also the name of the dog owned by the young version of Holland’s Henry) when he gets the news that his estranged father has committed suicide. His journey back to the rambling Victorian on the edge of the woods mirrors the other Henry’s trip home in episode one, but this Castle Rock is different, mostly in a good way. The downtown is bustling and prosperous. Local dive the Mellow Tiger is a cheery “gastropub.” Instead of a haunted pill-popper, Molly (Melanie Lynskey) is the vibrant, outgoing head of the city council. This time, there’s no Shawshank-style secrecy. The police are summoned, and one of the cops is Dennis Zalewski (Noel Fisher), the would-be whistleblower who died several episodes ago in the prime reality after suddenly snapping and shooting several of his fellow prison guards. 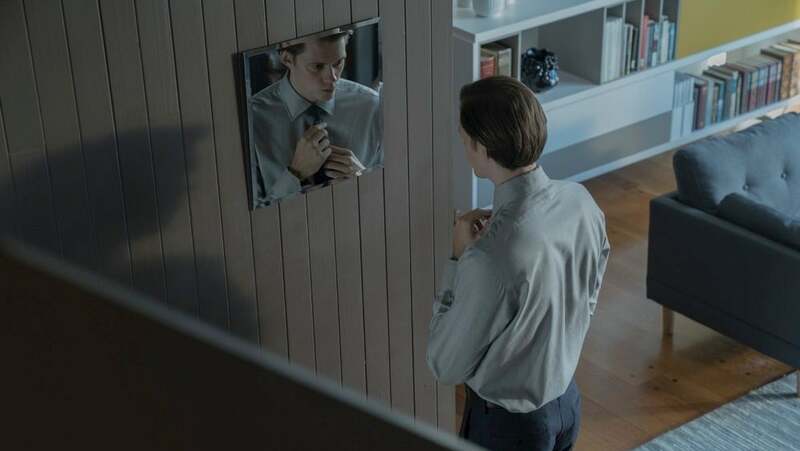 Skarsgård’s Henry tells Zalewski that his dad was fixated on hearing the voice of God, and that he used to force his son to accompany him on late-night treks through the woods to try and hear it. As everybody—including Molly, who still lives in the house next door—stares on in horror, the shell-shocked kid makes a break for the woods, but he’s quickly collected. “Where was he trying to go?” Molly’s sister wonders. Nobody knows. Even we don’t know, but we’d sure love for Castle Rock to show us...and it did. Henry’s return home has suddenly gotten very complicated. But he’s a scientist — he’s focused and methodical, and he’s got access to a house stuffed full of clues, chiefly his father’s hours and hours of audio diaries. Most of them contain monotonous droning about how Castle Rock has been cursed from the beginning (we’re treated to a vivid history lesson on the original French settlers who starved and froze to death, leaving just one young survivor who had to eat the flesh of her own family to survive), as well as musings on his struggle to hear the voice of God. Was Matthew Deaver a madman — or was he the only person in town who knew what was really going on? Yes...and yes. As Henry (and we) listen to the tapes, we get the full story. That sure sounds a lot like what Warden Lacy — who also committed suicide after years of watching over the Kid in his own cage — told Alan Pangborn. And sure enough, young Henry isn’t out of his cage for more than a few hours when a deadly hospital fire breaks out, mirroring the Kid’s immediate chaos effect once he’s sprung from the Shawshank basement. 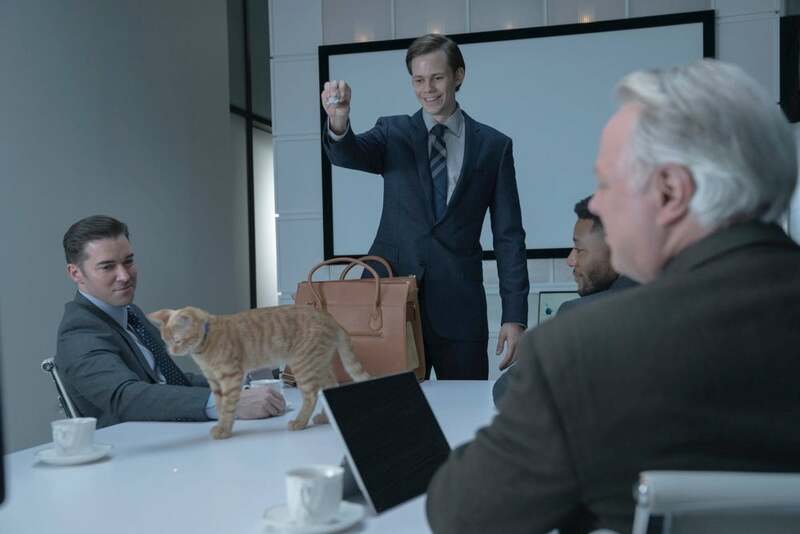 Molly uses her political clout to get access to Henry, and she and Skarsgård’s Henry quiz the confused, shell-shocked youngster. He’s not very responsive, but when Molly — who has yet to display the same psychic abilities that she does in the prime reality—touches his hand, she sees flashes of his reality and realises that bringing him “toward the sound” is what has to happen. She’s able to convince the police to release the boy into her and Henry’s custody for the night, and then manages to evade Officer Zalewski and help the boy escape into the woods. Here’s where it gets woo-woo. A bubble of space out of time opens up, and young Henry sees a frightened girl in old-timey clothing holding a bloody knife; presumably, she’s that young French settler who had to turn to cannibalism to survive, in what Matthew Deaver deemed the first terrible evil to happen in Castle Rock. When Molly touches the boy’s shoulder, she shares his vision. 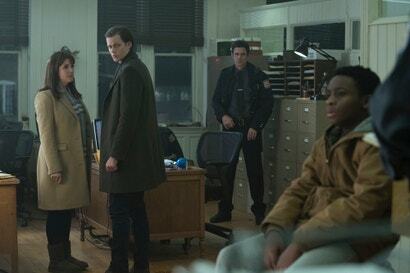 Meanwhile, even though Skarsgård’s Henry tries to calm him down, a jittery Zalewski runs up with his gun drawn. Everybody starts scrambling through the woods, and the sky over Molly turns all orange and wormhole-y. Even though she stops, a bullet — which we clearly saw Zalewski fire into the sky, only intended as a warning shot — somehow hits her in the back. This tracks with the gut-punch last scene of last week’s episode, in which the Kid solemnly informed Molly that the woods are “where you died.” Her last words are “Help him,” and the two Henrys find themselves both in the weird space-time bubble with other unfortunate victims of Castle Rock’s bad juju, including the French settler. Suddenly—zoop!—Skarsgård’s Henry is knee-deep in snow, and as he stumbles to the cliff overlooking Castle Lake (you know, where Warden Lacy died), he sees Alan Pangborn spotting the long-missing younger Henry, as seen in Castle Rock’s first episode. Well, do you? Or is this just the Devil telling a tall tale, trying to convince Molly to help him while misdirecting all of us in the process? 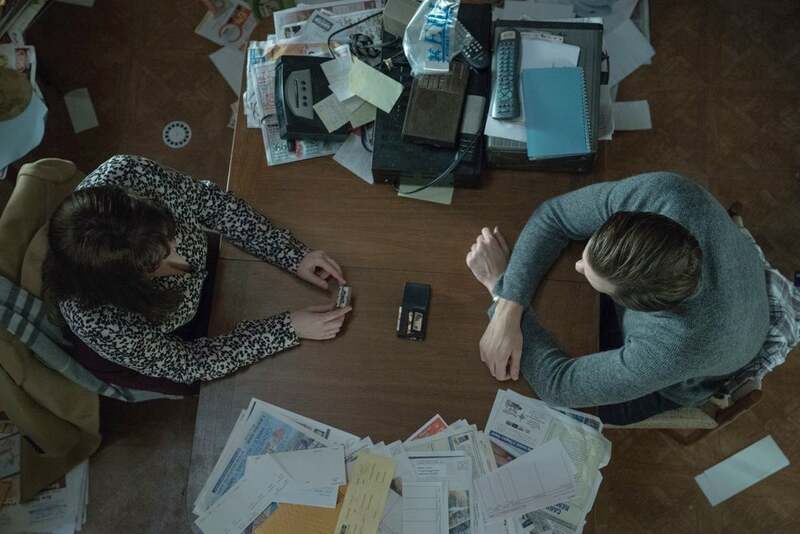 The whole season of Castle Rock has been building up to “Henry Deaver,” a bold and unsettling episode that reminded us never to trust what we think we’re seeing in this town. Henry’s pitch about his Alzheimer’s invention is very thematically on the nose, something Castle Rock is so very fond of doing: “Continuity. It’s hard work. We don’t notice we’re doing it, but we are placing events in sequence so that our lives make sense. When continuity is interrupted, everything starts to slide,” leading up to “ultimately, confusion with time and space.” Yep. In the secondary reality, Matthew Deaver lived long enough to build his own soundproof listening chamber; we get a glimpse of it just beyond the backyard. Wonder if he had any followers in this timeline who chose to deafen themselves to tune into “the schisma” more clearly? We still don’t know who or what caused Matthew’s devastating accident when Holland’s Henry slipped through the dimensions. Could Matthew’s sick-bed accusation of “Henry did it” actually have meant “Henry travelled into another dimension,” rather than what Alan Pangborn assumed? Matthew Deaver and Warden Lacy’s relationship is still a little unclear to me. 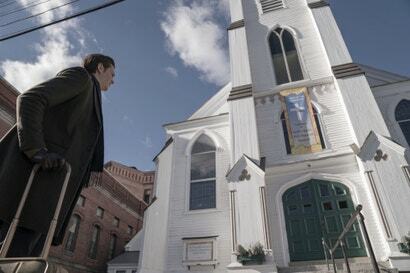 The “keep the Devil in a cage” plan came to the secondary-timeline Deaver when he decided that the “new” Henry had been sent to him by something sinister, not by God. So, how and why did prime-timeline Lacy decide to do the same to the Kid (especially since the Kid appeared after Deaver died in that timeline)? Why did Lacy paint portraits of Skarsgård’s Henry over and over, and why did the earliest painting feature him in the same outfit as young Henry’s “missing” poster? Were the suicides planned as a way to draw the other Henrys back to Castle Rock to try and set the timelines right? Are there other realities besides these two, and will we see them? Have other Castle Rock residents also slipped between the dimensions? To that end, have we met any other characters who are also travellers, and just not realised it? So...does a person who’s in their wrong timeline just have a negative effect on everyone they touch and/or are able to unconsciously influence? Where was the Jackie Torrance character in the secondary timeline? No room for her in a slightly brighter version of Castle Rock? Maybe she’s just not friends with the upstanding citizen version of Molly? Is Castle Rock making me crazy, or was Henry’s wife in the secondary timeline portrayed by the same actress who played the cheatin’ woman who met her gory end at the true crime B&B? 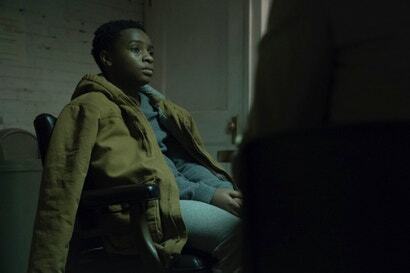 Hopefully the Castle Rock finale — which airs next week — will deliver a conclusion that satisfies, even if it doesn’t fill in all the blanks. I mean, how could it, and would we even want it to?